To become as good a tennis player as Andy Murray take many years of dedicated practice and with years and years of practice increases the risk of accumulated injuries. With Wimbledon comes an upsurge of interest in tennis,we offer some invaluable advice on staying injury free this tennis season. For two weeks at the end of June, a certain ‘fever’ tends to sweep the country, this being ‘tennis fever’. Tennis is the second most played racket sport in the UK, close to overtaking badminton in popularity, with an estimated 860,000 people playing. Bedford Chiropractic Clinic will see an increase in tennis related injuries. Just the same thing happens every year in the tennis season but with Andy Murray winning even more people will try tennis for the first time. Incorrect technique – poor serve and swing technique will increase the chance of injury, particularly to the elbow and wrist. Relying on only the arm to hit the ball, as opposed to the body’s full strength, leads to an incorrect swinging action. A healthy spine able to flex and absorb these heavy twisting loads the discs in the spine can suffer serious injury that can impact everyday life not just sporting ability. Failure to warm up and cool down – warming up / cooling down reduces the risk of muscle and joint injuries, and improves performance. Time spent playing – overexertion is one of the most common causes of injury, and with insufficient rest and recovery time for the body, overuse injuries are more likely to occur. Previous injury – previous injury can lead to similar injuries in the future, especially if you hadn’t taken enough time to fully recover. When it comes to tennis injuries, they fall into one of two categories; two-thirds of tennis injuries are due to overuse, and the other one-third due to trauma or an acute event such as sudden force or impact. Cumulative, or overuse, injuries most often affect the shoulders, elbows and wrists, with acute injuries affecting the low back, knee or ankle. Tennis Elbow – the most well-known of all tennis injuries, it is estimated that over 50% of players will suffer with it at some point in their career. It is an overuse injury of the muscles that bend the wrist backwards, from repeated contraction, and can also be caused by improper technique, such as using too much wrist and not enough arm when you hit a backhand shot (faulty backhand follow-through). Tennis Shoulder – shoulder overuse injuries are usually a result of poor conditioning and strength of the rotatory cuff muscles, a group of muscles at the back of the shoulder. These muscles help to position the shoulder correctly in the socket, and a weakness can cause an increase in ‘play’ of the ball in the socket, irritating the tissues. Tennis shoulder injuries often appear after over-loading the rotator cuff when the muscles are contracting, and are usually caused during the follow-through phase of the serve. These injuries cause pain when the ball makes contact with the racquet during the serve, and cause a decrease in serve velocity. Tennis Ankle – these injuries fall into the traumatic/acute bracket and are caused by a sudden sideways movement, such as pivoting while making a subtle but rapid change in direction, resulting in twisting or turning the ankle inwards. Playing on a slippery wet surface increases the risk of these types of injuries, as does continuing to play, even when fatigue is overwhelming you. Low back pain – many tennis players will suffer with low back pain at one time or another. It can be caused by the twisting/rotating movement when trying to hit the ball, the sudden deceleration and changes in direction during a game, or over-extending the back during the serve; this repetitive action places considerable stress on the muscles, tendons and ligaments around the spine, and on the spinal joints themselves. Any accumulation of injury to the discs must be avoided at all times as the discs do not have a blood supply and cannot heal very well. All too often this fact is ignored and the damage accumulated becomes too extensive and permanent disability is the result. Just taking painkillers and waiting for such injuries to heal is a recipe for disaster. What is a Stress Fracture of the Back? A stress fracture of the back, or lumbar spine, is one of the more common bone injuries in young tennis players. Lower back stress fractures are usually characterized by an ache in the lower back which is exacerbated by sporting activities and eased by rest, although a small percentage of people with a stress fracture can be pain free. Typically it is sore when the patient bends backwards, particularly if standing on one leg. If a lower back stress fracture is suspected, a chiropractor may decide to refer the patient for a MRI scan to confirm the diagnosis. What can you do to prevent a Stress Fracture? Serving in tennis requires a combination of spinal hyper extension (bending back) together with rotation and side bending of the trunk. This puts a lot of stress on an area of the vertebra called the Pars Interarticularis and this is where stress fracture develops. Practicing the service should be carefully monitored by the coach to ensure the lower back is not being overloaded. This is particulary important in adolescent players who have just experienced a growth spurt as they are known to be more at risk from this injury. core stability exercises can help prevent back problems in tennis players. What should you do if you suffer a Stress Fracture of the Back? In most cases, complete rest from tennis is the treatment of choice. This would usually be for a period of 6 weeks to allow the bone to heal. In the early stages, a soothing ice pack can reduce back pain and alleviate back pain. During this period, a progressive exercise programme may commence, under the supervision of a qualified chiropractor. This usually starts with exercises to increase the muscular stability in the lower back. Research has shown that a lack of muscular stability in the lumbar and pelvic regions can lead to low back pain and stress fractures. The principle behind this is that if certain specific muscles can be recruited or contracted, the spine will have much better support. This prevents postural faults which can predispose a person to back pain. Elite tennis players in their teens appear to have a very high rate of lower spine injury, a 2007 study suggests. Although the subjects in this study did not have symptoms, the researchers point out that these injuries will probably progress to more serious conditions if training techniques are not modified. As with common back problems because it doesn’t hurt doesn’t mean that a problem doesn’t exit. The British researchers found that of 33 elite-level tennis players they examined, 85 percent had some sort of abnormality in the lower spine. Damage to the joints at the back of the spine, stress fractures and herniated discs were among the problems seen on MRI scans. Tennis players’ careers depend largely on how well they perform at the junior level, the study authors note in their report, published online by the British Journal of Sports Medicine. This means that during their growth spurt years, young athletes are going through frequent and intense training that can raise their risk of injury. Tennis involves constant spinal movements — like quick twists and backward arching — that can account for the injuries seen in this study, according to the authors, led by Dr. David Connell of the Royal National Orthopedic Hospital. The findings are based on 18 male and 15 female athletes training at a UK national tennis center. None complained of any back pain, but using MRI scans, Connell’s team found that only five players had normal exam results. The most common abnormality was facet joint arthropathy, damage to joints at the back of the spine that are involved in backward arching. A full 70 percent of the players showed this problem; in contrast, studies of middle-aged adults in the general population have found that 8 percent to 21 percent of symptom-free people have facet joint arthropathy, demonstrating that spinal wear and tear is not painful until we then overload already weakened joints. In addition, the researchers found, more than one quarter of the players had sustained stress fractures in bone structures at the back of the spine, while nearly 40 percent had herniated spinal discs. It’s important to spot such abnormalities, they conclude, so that training can be modified to prevent the problem from worsening. SOURCE: British Journal of Sports Medicine, July 19, 2007 online. avoid playing on hard surface courts with no ‘give’, such as cement, asphalt or synthetic courts. inspect the court for holes/cracks that may trip you up. ensure the court is well lit if playing at night. avoid playing in extreme weather conditions. never play on a wet court. clean off leaves, debris, loose balls etc. from the court. wear shoes specifically designed for tennis that support the heel and prevent ankle rolling, choose tennis shoes with skid-resistant soles and high arch supports. consider wearing heel inserts or specially padded tennis socks to absorb the shock when playing on hard services to protect the lower back. see a professional to select a racquet that is the appropriate size and weight, and one that suits your skill level; too light or heavy will increase the risk of shoulder/elbow injuries. a flexible racquet with a larger head is gentler on the arm as the flexion absorbs some of the shock, spreading it over a longer period; this helps to prevent a tennis elbow injury. low string tension is better on the arm as it increases the dwell time of the ball on the strings. thinner strings are more elastic and have better shock-absorbing capacities, making them better for the arm. a grip that is too small or large will increase the risk of an elbow injury as the player has to grip the racquet too tightly to prevent it from twisting. never play with wet tennis balls, especially if you have had a previous shoulder/arm injury. avoid old or low-pressure balls; aim to replace them as soon as they start to lose their bounce. working on stretching and toning your arm muscles off the court will guard against injury; swimming is a good way to achieve this. warm up gently, increase your heart rate with a slow jog or jumping jacks. slowly stretch muscles to improve joint range of motion, and promote elasticity in the ligaments and tendons; hold stretches for 30 seconds. start slowly, hitting a few balls to your opponent; serve several times until the shoulder feels looser. be sure to cool down with stretches after playing to prevent stiff and sore muscles and joints. take lessons from a qualified coach to develop skills and technique. when serving/hitting overhead, avoid over-arching the lower back; bend your knees and raise your heels instead, so the upper body weight is evenly balanced. avoid landing on the ball of the foot as this can lead to an Achilles’ tendon injury. hitting the ball in front of the body makes it easier to fully use the shoulder and trunk. forearm muscles are better able to handle the shock if the wrist is held straight when the ball impacts the racquet. use the forearm for control, and the shoulder/trunk for strength. use the other arm for balance with one-handed backhand. in the event of a previous injury or weakness to the elbow, try a two-handed backhand. If you sustain an injury on the tennis court, the best plan of action is to stop playing and seek the appropriate advice and treatment. Chiropractors, whilst best known for treating spinal injuries, are also trained in treating all of the other joints of the body, including the shoulder, elbow and wrist. If you get gripped with tennis fever, and even with following these hints and tips, you still sustain an injury of your muscles, bones or joints, chiropractic may have the answer. Hi! Dr Sandhu here, hope you have all recovered from the excitement from last night, what an incredible display of the power of our weather. I must say I’m really excited as I have just received my brand new Activator 5! Another example of our continual drive to give the best chiropractic adjust possible to our patients! The Activator Method is one of the most widely-researched chiropractic techniques and the only instrument adjusting technique with clinical trials to support its efficacy. Activator Methods has published hundreds of clinical and scientific peer-reviewed papers, worked with major academic research institutions, and received grants from recognized entities like the National Institutes of Health. 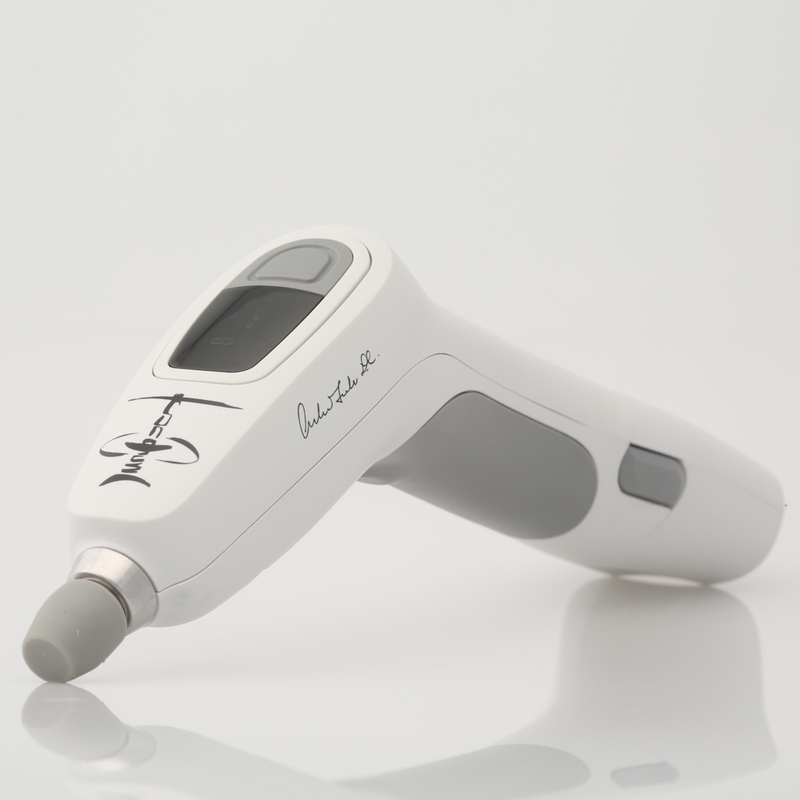 Utilizes a force wave that allows deeper penetration of the force without discomfort to the patient. Recognized for superior control of speed, force, and direction of thrust. Perfect for use on the more tender areas of the body, due to the light, pre-load spring. Ideal for treating Cervicals, TMJ, Children, Geriatrics, and small body frames utilizing the #1 settin g.
To celebrate WORLD VEGAN DAY here are some delicious vegan recipes to try out! Preheat the oven to 200ºC/gas 6. Rinse and dry the kale leaves before removing most of the centre stalk, leaving long, thin pieces of kale. Toss the kale in the oil, then sprinkle with the sugar, cinnamon and ½ tablespoon of sea salt. Arrange the leaves in a single layer on a couple of baking trays and bake for 5 minutes, until crisp. Transfer the kale to a rack to cool, then serve. extra virgin olive oil Method Cook the wild rice according to the packet instructions, then drain and leave to cool on a large tray. Peel the onions, then using a mandolin (or a food processor with a fine slicing attachment), finely slice them. Transfer to a bowl and add the red wine vinegar. Scrunch them together and set aside. 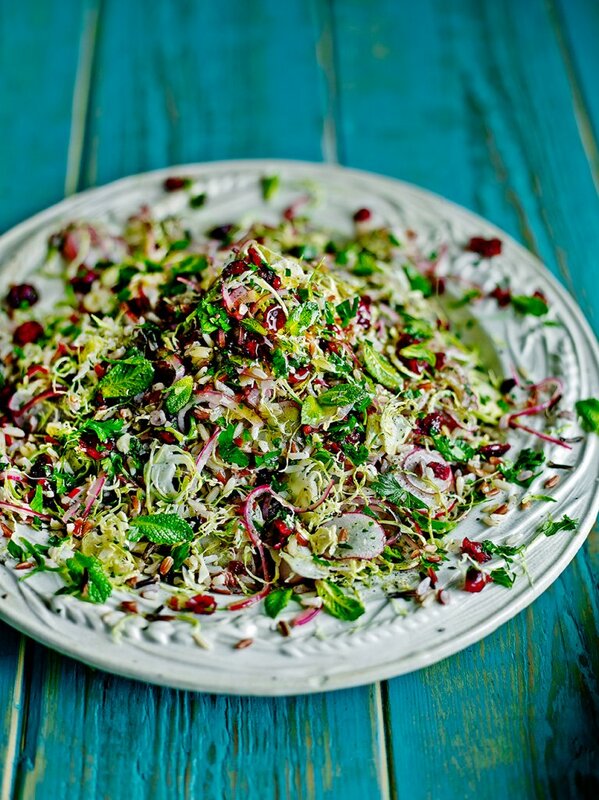 Using a mandolin, shred the sprouts and radishes, then, in a bowl, dress them with the lemon juice and a pinch of sea salt, massaging the flavors into the veg with your hands. Set aside. Pick and finely chop the herb leaves and pop them into a large serving bowl. Add the rice, onions and lemony veg as well as the cranberries or raisins, and toss together. Drizzle over some oil and season, then stir and serve. Prepare a 500ml pickling jar by washing the jar and lid, removing the rubber seal. Place in the oven and heat at 100ºC/gas ¼ for about 30 minutes. Immerse the rubber seal in a pan of boiling water and simmer for about 10 minutes before turning off the heat and allowing to cool. Peel and finely slice the shallots, then destone and roughly chop the plums. Heat the vegetable oil in a pan that’s big enough to hold all the ingredients. Add the shallots and cook gently over a low heat until softened and golden-brown. Add the bay leaves and spices, fry for a minute, then stir in the plums. Add the sugar and grate in the orange zest. Squeeze the orange juice into a measuring jug and top up to the 450ml mark with cider vinegar. Add to the pan and bring to the boil, then simmer slowly until most of the water has evaporated and the chutney is reduced and thick, stirring now and then as it cooks. Preheat the oven to 200C/gas 6. Place the pine nuts on a baking tray and roast in the oven until golden, set aside to cool down. Trim the outer leaves and base from the cauliflower then cut into small florets. Trim the ends from the Brussels sprouts and slice in half, keeping hold of the loose leaves. Cover the raisins in boiling water, leave for about 20 minutes, then drain and set aside. Place the cauliflower florets and sprouts in a large roasting pan, scatter over the saffron threads then pour over the olive and garlic oils. Season well and mix together gently. Roast for 25–30 minutes, until the florets and sprouts are tender and starting to caramelise. You may find that the loose sprout leaves start to really crisp up; don’t be alarmed, it adds a lovely smoky element to the overall flavour. Transfer the roasted cauliflower and sprouts to a serving bowl; add the pine nuts and raisins, season to taste then give the whole mixture a gentle stir to ensure everything is combined and coated in the saffron oil, and then serve. 1. Preheat the oven to 180C/gas 4. Spread out the nuts and seeds on a baking tray and toast in the oven for 5–6 minutes. Transfer to a food processor, along with the chestnut purée, suet and maple syrup, and blitz until it comes together into a ball. 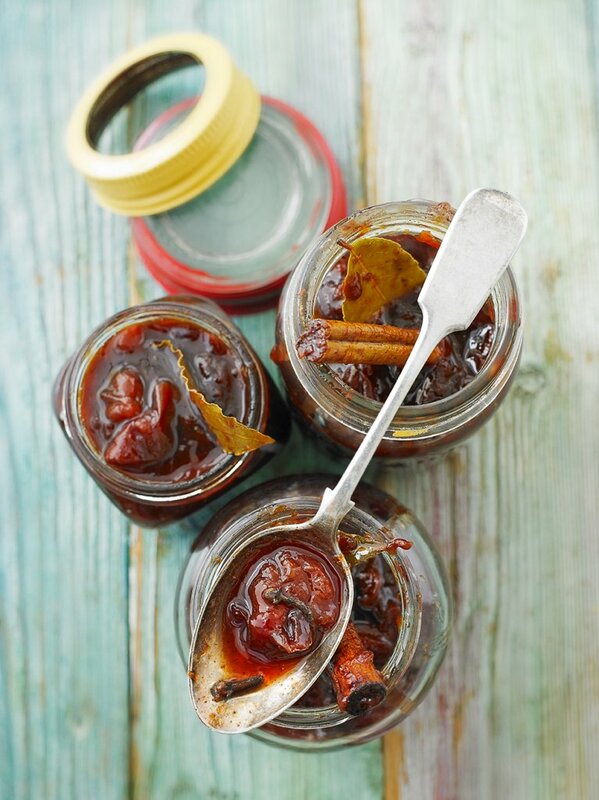 It will be sticky to begin with, so stop and scrape the sides as you go. 2. Place a large sheet of baking parchment on a work surface and sit the dough on it. Then, with lots of gluten-free flour on your hands and rolling pin, roll out the dough as thinly as possible (less than 5mm). 3. If you’re making individual tartlets, oil and flour four 10cm loose-bottomed tart tins, then cut the pastry to size. For 1 large tart, roll out the dough and cut to the size of a large, shallow baking tin, and transfer to the tin using a fish slice. Prick the pastry all over with a fork, cover with baking parchment, fill with baking beans or rice and bake blind for 12–15 minutes. Leave to cool in the tray, and keep the oven on. 4. Meanwhile, make the topping. Heat 1 tbsp rapeseed oil in a pan over a medium heat, then sauté the mushrooms for 6–8 minutes, until golden. Remove and set aside. 5. In the same pan, heat the rest of the oil and wilt the spinach (or heat through if frozen) along with the pepper. Blitz the spinach, avocado flesh, tofu, nutmeg and lemon juice in a food processor until smooth. 6. Thinly slice the sweet potato using a vegetable peeler or mandolin, creating a pile of peelings. Heat a drizzle of olive oil in a small pan, then fry the peelings over a high heat, turning occasionally, for 4–5 minutes, until just turning crisp. 7. Assemble the tart by spreading the spinach mixture over the baked and cooled tart base. 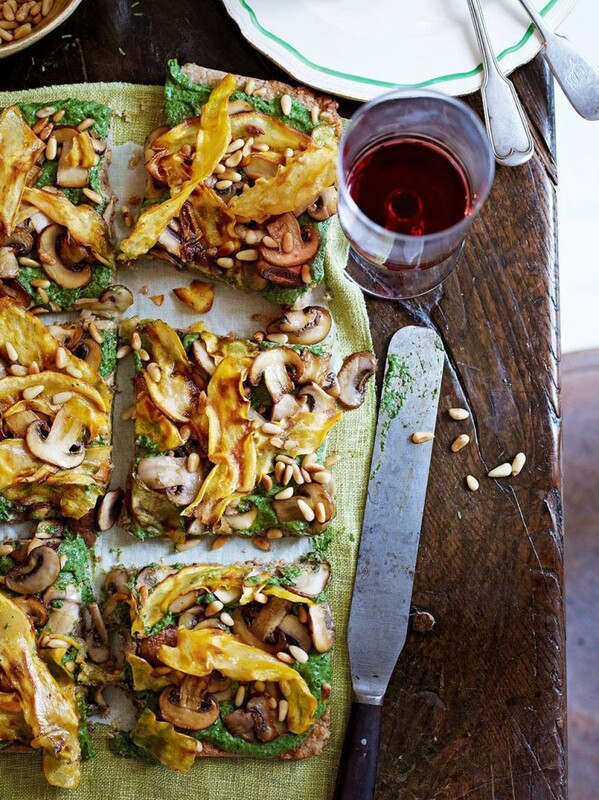 Lay the mushrooms on top, and decorate with the sweet potato slivers and a scattering of toasted pine nuts. Eat heated or at room temperature, with potatoes and vegetables. Keep an eye out on our blog, there will be more recipes to come!! This Halloween Take Care of Your Skeleton! Happy Halloween! This year, while ghosts and goblins lurk outside, look within – to your own skeleton. Bone health is an essential, yet often ignored, component of a winning wellness plan. Taking care of your bones can scare off a host of frightening conditions such as osteoporosis, back pain, fractures and arthritis. This Halloween, join Dr. Surinder Sandhu here at our Bedford chiropractic clinic in focusing on bone health. Read on to learn about the revolutionary chiropractic formula for making your skeleton smile. The foundation of the chiropractic approach to bone health is the correction of dysfunctional areas in the spine. These areas, called vertebral subluxations, arise when movement is restricted or bones (vertebrae) are misaligned. Vertebral subluxations are linked with a myriad of conditions including back pain, neck pain, headache and carpal tunnel syndrome. One study found that 84% of patients with migraine or tension headache had at least 2 major vertebral subluxations in their upper neck (Journal of Manipulative & Physiological Therapeutics 1992;15;418-29). Another investigation tracked 59 people with sciatic pain. When doctors of chiropractic just like Dr. Surinder Sandhu here at our Bedford chiropractic clinic evaluated these patients, they showed signs of vertebral subluxation in their low-backs. Additional reports suggest a possible link between vertebral subluxations and premenstrual syndrome, asthma, ear infection, bedwetting, high blood pressure and sinusitis. Chiropractors like Dr. Surinder Sandhu aour Bedford chiropractor, correct vertebral subluxations with gentle manoeuvres called chiropractic adjustments. A wealth of scientific studies show that chiropractic adjustments safely and effectively correct spinal dysfunction – and the disorders associated with it. How Scary Is Your Posture? Structural imbalances like these alter the natural motion of the spine, leading to degeneration and osteoarthritis. Imbalance spines are also predisposed to injury from repetitive work or sports activities. In fact, many “injury-prone” individuals aren’t me rely unlucky – they have postural discrepancies. Poor posture doesn’t just affect the spine, it influences the entire skeleton. For instance, imbalances in the spine often cause one hip to rise slightly, raising up the adjoining leg. During walking or running, the legs receive a disproportionate amount of force – triggering injury. Dr. Sandhu our Bedford chiropractor teaches patients simple “posture checks” to monitor their spinal alignment. When posture is askew, patients learn to regain alignment – and prevent future posture problems – through chiropractic adjustments, ergonomic modifications and exercise. Patients enjoy more attractive stances, warding off bone disorders while enhancing self-confidence. Chiropractic c are can help you steer clear of this collision course. Range of motion (ROM) problems are associated with vertebral subluxations. Chiropractic adjustments effectively correct vertebral subluxations, promoting optimal ROM. In one study, investigators measured neck ROM prior to chiropractic adjustment, and then again 30 to 45 minutes following the procedure. Chiropractic adjustments to the side of the neck, where motion was restricted, produced a “dramatic reduction” in ROM restriction (Journal of Manipulative & Physiological Therapeutics;1989;126:419-27). Over time, chiropractic adjustments stimulate long-term ROM corrections. In addition to chiropractic adjustments, chiropractors recommend custom-tailored exercises; designed to encourage optimal ROM. Regular workouts are an integral part of the chiropractic approach to bone health. Exercise has been shown to boost skeletal integrity by increasing bone density. Especially helpful are “impact” or “weight-bearing” sports such as power-walking, running, volleyball, soccer, kickboxing and weightlifting. These activities subject the skeleton to mild trauma. Bones respond to this trauma by becoming stronger. Scientific studies show that certain foods, including sugar, hasten bone degeneration – while other foods boost bone health. Bone-eroding foods include refined sugar, grains and flour, processed food s, foods containing additives like EDTA, caffeine, soda, sodium-rich foods and meat. On the other hand, bone-building foods include fruits and vegetables; whole grains and high-fiber foods; fish with edible bones, soy products, low-fat dairy products, raw nuts and seeds. When it comes to dietary supplements, calcium is the most well known bone-boosting supplement. However, simply choosing a calcium supplement off the drugstore shelf – without doing your homework – may give you nothing but a false sense of security. First, look for a calcium citrate formulation. According to scientific research, calcium citrate is more potent than other forms of the mineral. For example, one study compared subjects who took calcium carbonate. Findings revealed that the blood calcium levels of participants taking calcium citrate were 2.5 times higher than those taking calcium carbonate. These findings indicate that the body is better able to use calcium citrate than calcium carbonate. Many experts also caution that calcium be taken in conjunction with magnesium for optimal effectiveness. In addition to calcium, other bone boosting supplements include vitamin D, potassium, vitamin K, manganese, zinc and antioxidant vitamins. While calcium is the most popular supplement used to prevent osteoporosis, glucosamine and chondroitin sulphates are the most celebrated anti-osteoarthritis remedies. These supplements prompt the growth and repair of damaged joint cartilage by stimulating the production of two connective tissue building blocks – glycosaminoglycans and hyaluronic acid (Alternative Medicine Review 1998;3:27-39). By keeping joints healthy, glucosamine and chondroitin protect surrounding bones from degeneration. Other potent all-natural, anti-inflammatory, agents include the pineapple enzyme bromelain, flavonoids, curcumin (the active ingredient in the spice turmeric), and thyme and fish oil. This Halloween, don’t get spooked by thoughts of future bone disease. Turn to your doctor of chiropractic for sound advice on how to prevent skeletal disorders. Don’t delay – schedule an appointment with Dr. Surinder Sandhu here at our Bedford Chiropractic clinic for a Consultation today. It’s just the treat that will keep the trick knees, trick backs and other trick skeletal flaws away. Halloween! Have a look at our WEBSITE and FACEBOOK! In traditional holistic medicine ginger is often used in the treatment of different health conditions, ranging from nausea to pain. Ginger has the power to reduce nausea and vomiting, but that’s not all. The list of its benefits seems to be never-ending. For more than 2,000 years, Chinese have used ginger to treat nausea, stomach problems, arthritis, heart diseases and disorders. Ginger has the ability to reduce chronic inflammation, pain and migraine. It is also beneficial in the treatment of ulcer, gout and diabetes complications. Ginger contains gingerol and shogaol, and these active compounds give its healing power. Ginger is high in potassium, which is important for proper heart function, and manganese, a mineral that increases the resistance to different diseases, and strengthens the lining of the heart and circulatory system. Ginger is rich in silicon, which contributes to healthy skin, hair, teeth and nails. It contains vitamins A, C, E, B complex and minerals like magnesium, phosphorus, sodium, iron, zinc, calcium and beta-carotene. Studies have shown that ginger has the power to reduce muscle pain and back pain. It is also known to reduce inflammations and migraine. It is especially beneficial for women, as Scientists have confirmed that ginger has anti-inflammatory and analgesic properties, and modern scientific studies have shown that ginger can inhibit the formation of inflammatory compounds and anti-inflammatory properties. Ginger has been used in the treatment of nausea for thousands of years. It is widely used because it is more efficient in treating indigestion and nausea, when compared to many antacids and antihistamines. It has the same effect as many antihistamines and decongestants. The combination of ginger and tamarind leaves is excellent for colds and coughing. Just brew some ginger and tamarind leaves in hot water, crush and add some honey. Boil 2 cups of water, and add the ginger. Reduce the heat to medium low, and let the mixture simmer for 5 minutes. Take it off the heat and strain. When serving, use 1 part of ginger syrup and 3 parts of sparkling water. Serve it on the rocks. Sweeten to taste, using raw honey, or stevia, and add some lemon juice. Enjoy in this drink! A great way to start your day with YOGA! Some yoga methods use specific meditation techniques to focus the mind on your breathing that quietens the constant ‘mind chatter’, relieves stress and allows you to feel relaxed. Practising yoga can also boost oxygen levels to the brain, leaving you feeling happier and more content with everyday life. Aside from the uplifting spiritual values, the act of meditation can actually boost your confidence. The process works by releasing tension from your mind so you can feel confident about your physical body. Without any forms of anxiety, you are able to establish an internal connection with yourself. This is consequently reflected in your perception of others and will help to better your relationships by improving compassion and awareness. Exercise, such as running, is usually a series of rapid, forceful movements, which means that effort is at a maximum and there is a higher risk of injury and increased muscle tension. Often, strenuous exercise also engages an imbalance of opposing muscle groups whereas yoga concentrates on balancing this activity. Yoga unites your body and mind and therefore allows you to move in a way that results in an injury free, healthier you. Being overweight is a sign that there are imbalances in your everyday life and one major contributor to weight gain is excess stress. Practising yoga enables you to bring a deep sense of relaxation to your body and your mind, helping you to de-stress and allowing you to lose weight naturally. People often say that they are not flexible enough to do yoga. The truth is it doesn’t matter how tight your muscles are as yoga asana works by safely stretching your muscles and help you to practise it further. Moreover yoga also stretches other soft tissue in the body such as ligaments and tendons, increasing the range of motion in the joints and allowing you to move around more freely. Many yoga asana have a profound effect on your upper body strength, such as the downward and upward dog and the plank focuses on your core. Likewise standing poses strengthen your upper leg muscles and lower back. Essentially any pose will strengthen an area of the body if it is practised in the right way, without putting too much stress on specific muscle groups. If you are to practise yoga consistently, your lung capacity will increase as a result of the deep breathing process. This will then have a positive effect on more intense sports that you might be a part of, increasing your stamina and endurance. Furthermore, meditation and calming yoga asana slow down your heart rate which in turn lowers blood pressure and have also been linked with improving the immune system and lowering cholesterol. Chiropractic care and Yoga can complement each other and help to build a strong, stable spine. Chiropractic works by addressing underlying spinal conditions, and Yoga can be a wonderful and gentle way to build core strength, stabilising the muscles around the lower back. Combining Chiropractic care with Yoga can increase stability, flexibility and lead to greater body function. For more info Take a look at our Website! What Are The Basic Causes Of Breast Cancer? According to Ayurveda philosophy, breast cancer is a tridoshic (involving all three body humors) disorder of breast tissue. Basic causes for breast cancer could be both hereditary and acquired. Researchers have identified hormonal, lifestyle and environmental factors that may increase your risk of breast cancer. The risk of breast cancer goes up with age. The risk is higher among women whose close blood relatives have this disease. Inherited changes (mutations) in certain genes like BRCA1 and BRCA2 can increase the risk. A woman with cancer in one breast has a greater chance of getting another breast cancer (this is different from a return of the first cancer). Overall, white women are slightly more likely to get breast cancer than African-American women. Women who began having periods early (before age 12) or who went through menopause (stopped having periods) after the age of 55 have a slightly increased risk of breast cancer. Dense breast tissue means there is more gland tissue and less fatty tissue. Women with denser breast tissue have a higher risk of breast cancer. Women who have had radiation treatment to the chest area (as treatment for another cancer) as a child or young adult have a greatly increased risk. The use of alcohol and tobacco smoke is clearly linked to an increased risk of getting breast cancer. Even as little as one drink a day can increase risk. Being overweight or obese after menopause (or because of weight gain that took place as an adult) is linked to a higher risk of breast cancer. Contrary to its name, this fruit seed is not in any way related to wheat. Buckwheat is a gluten free power food! It is becoming very popular for many good reasons. It is a highly nourishing, energizing and tasty food that can be eaten instead of rice or the usual porridge. Best source of high-quality, easily digestible proteins. This makes it an excellent meat substitute. High protein buckwheat flour is being studied for possible use in foods to reduce plasma cholesterol, body fat, and cholesterol gallstones. Buckwheat starch can also act as a fat alternative in processed foods. The high level of rutinis extracted from the leaves for medicine to treat high blood pressure. Buckwheat hulls are used as pillow stuffing for those allergic to feathers, dust, and pollen. New evidence has found that buckwheat may be helpful in the management of diabetes according to Canadian researchers in the Journal of Agricultural and Food Chemistry. With a glycaemic index of 54, it lowers blood sugars more slowly than rice or wheat products. Buckwheat grows so quickly that it does not usually require a lot of pesticides or other chemicals to grow well. Buckwheat is good at drawing out retained waterand excess fluid from swollen areas of the body. Read how to make a Buckwheat Plaster. Buckwheat is a warming food. It is classified by macrobiotics as a yang food. It is great for eating in the cold winter months. Buckwheat contains no gluten and is not a grain. It is therefore great for celiac and those on grain free and gluten sensitive diets. I use it often in my Healthy Web Boot Camps. Buckwheat is actually the seed of a flowering fruit that is related to rhubarb and sorrel. It’s completely gluten-free and unrelated to wheat and all the grasses in the wheat family. So it’s a popular substitute for wheat for those who are gluten-intolerant. It’s also a plant known for its honey; the flowers are attractive to bees and its pollen produces a dark and uniquely flavored honey. Buckwheat was a common and popular crop in Europe and the United States for many years – but more as animal feed than as human food. It had a resurgence in popularity in the 1970s when its health benefits became understood. What can you cook with buckwheat? We prefer the strong taste of buckwheat, as delicious as it is, in moderation. One popular use is pancakes; we prefer partial buckwheat flour used in proportion to wheat. A very common use for buckwheat is porridge; the term kasha in the United States has grown to mean buckwheat breakfast porridge. (The original Slavic word could refer to any sort of porridge.) You can also make cold grain salads and hot grain casseroles with the whole groats, as well as bread and many other healthy baked goods with ground buckwheat flour. It is loaded with protein, fibre and minerals, but doesn’t contain any gluten. Here are 11 proven health benefits of quinoa. Quinoa is a grain crop that is grown for its edible seeds. It is pronounced KEEN-wah. It technically isn’t a cereal grain, but a pseudo-cereal, In other words, it is basically a “seed” which is prepared and eaten similarly to a grain. Quinoa was an important crop for the Inca Empire back in the day. They referred to it as the “mother of all grains” and believed it to be sacred. It has been consumed for thousands of years in South America, although it only became trendy and reached “superfood status” a few years ago. These days, you can find Quinoa and products made with it all over the world… especially in health food stores and restaurants that emphasize natural foods. 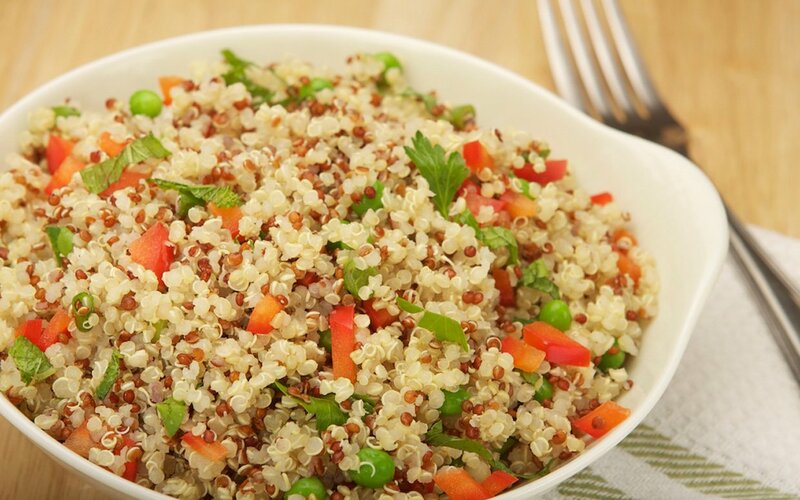 There are three main types of quinoa… white, red and black. This is coming with a total of 222 calories, with 39 grams of carbs and 4 grams of fat. It also contains a small amount of Omega-3 fatty acids. Quinoa is non-GMO, Gluten Free and usually grown organically. Even though not technically a grain, it still counts as a “whole grain” food. NASA scientists have been looking at it as a suitable crop to be grown in outer space, mostly based on its high nutrient content, ease of use and how easy it is to grow . The year 2013 was actually called “The International Year of Quinoa” by the United Nations (UN), based on its high nutrient value and potential to contribute to food security worldwide (4). Bottom Line: Quinoa is an edible seed that has become very trendy among health conscious people. It is loaded with many important nutrients. The health effects of real foods go way beyond the vitamins and minerals we’re all familiar with. There are thousands of trace nutrients in there… and some of them are extremely healthy. This includes interesting molecules called flavonoids, which are plant antioxidants that have been shown to have all sorts of beneficial effects on health. Two flavonoids that have been particularly well studied are Quercetin and Kaempferol… and they happen to be found in large amounts in Quinoa. In fact, the quercetin content of quinoa is even higher than typical high-quercetin foods like cranberries (6). By including quinoa in your diet, you will significantly increase your total intake of these (and other) important nutrients. Bottom Line: Quinoa contains large amounts of flavonoids, including Quercetin and Kaempferol. These are potent plant antioxidants with numerous health benefits. Another important benefit of quinoa is that it is high in fibre. 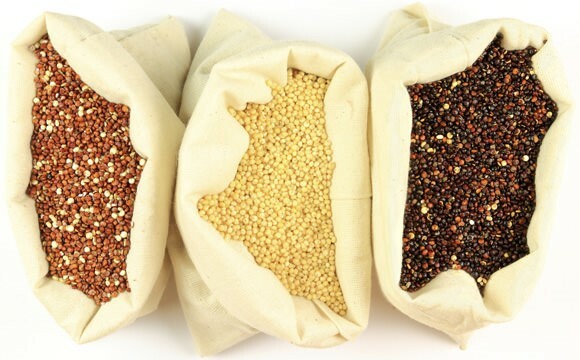 One study that looked at 4 varieties of quinoa found a range of between 10 and 16 grams of fibre, per every 100 grams of uncooked quinoa This equals 17-27 grams per cup, which is very high… more than twice as high as most grains. Boiled quinoa contains much less fibre, gram for gram, because it absorbs so much water. Unfortunately, most of the fibre is insoluble fibre, which doesn’t appear to have the same health benefits as soluble fibre. That being said, the soluble fibre content is about 2.5 grams per cup (or 1.5 grams per 100 grams), which is still decent. Bottom Line: Quinoa is much higher in fibre than most grains, with one source finding 17-27 grams of fibre per cup of uncooked Quinoa. According to a 2013 survey, about a third of people in the U.S. are currently trying to minimize or avoid gluten. A gluten-free diet can be healthy, as long as it is based on foods that are naturally gluten free. The problems arise when people eat “gluten free” foods made with refined starches instead. These foods are no better than their gluten-containing counterparts, because gluten free junk food is still junk food. Well… many researchers have been looking at quinoa as a suitable ingredient in a gluten-free diet, for people who don’t want to give up staples like breads and pasta. Studies have shown that by using quinoa instead of typical gluten-free ingredients like refined tapioca, potato, corn and rice flour, it can dramatically increase the nutrient and antioxidant value of the diet. Bottom Line: Quinoa is naturally free of gluten and using it instead of typical gluten-free ingredients can increase the antioxidant and nutrient value of a gluten-free diet. Protein is made out of amino acids. Some of them are termed “essential” because we cannot produce them and need to get them from the diet. If a food contains all the essential amino acids, it is seen as a “complete” protein. The problem is that many plant foods are deficient in certain essential amino acids, such as Lysine. With 8 grams of quality protein per cup of cooked quinoa (or 4.5 grams per 100 grams), quinoa is an excellent plant-based protein source for vegetarians and vegans. Bottom Line: Quinoa is high in protein compared to most plant foods and contains all the essential amino acids that we need. However… it’s important to keep in mind that quinoa is still pretty high in carbs, so it is not a good choice for a low-carb diet, at least not in large amounts. Bottom Line: The glycaemic index of quinoa is around 53, which is considered low. However, it is still relatively high in carbohydrates. There are many nutrients in the modern diet that people tend to be lacking in. This is particularly true of some minerals… especially Magnesium, Potassium, Zinc and (for women) Iron. Interestingly, quinoa is very high in all 4 minerals. It is particularly high in magnesium, with one cup having about 30% of the RDA. The problem is that quinoa contains a substance called phytic acid, which can bind these minerals and reduce their absorption. However, by soaking and/or sprouting the quinoa before cooking it, you can reduce the physic acid content and make these minerals more bioavailable. Quinoa is also pretty high in oxalates, which reduce the absorption of calcium and can cause problems for certain individuals with recurring kidney stones . Bottom Line: Quinoa is very high in minerals, but the phytic acid can partly prevent them from being absorbed. Soaking or sprouting quinoa degrades most of the phytic acid. Given the high amount of beneficial nutrients, it makes sense that quinoa could lead to improvements in metabolic health. The rat study found that adding quinoa to a diet high in fructose almost completely inhibited the negative effects of fructose. Bottom Line: Two studies, one in humans and the other in rats, show that quinoa can improve metabolic health. This includes lower blood sugar and triglyceride levels. Allowing quinoa seeds to sprout seems to increase the antioxidant content even further . Bottom Line: Quinoa appears to be very high in antioxidants, which are increased even further after the seeds are sprouted. In order to lose weight, we need to take in fewer calories than we burn. It is known that certain properties of foods can facilitate this process… either by boosting metabolism (increasing calories out) or reducing appetite (lowering calories in). Interestingly, quinoa has several such properties. It is high in protein… which can both increase metabolism and reduce appetite significantly. The high amount of fibre should also help to increase feelings of fullness, making us eat fewer calories overall. The fact that quinoa has a low glycaemic index is another important feature, but choosing such foods has been linked to reduced calorie intake. Although there is currently no study that looks at the effects of quinoa on body weight, it seems intuitive that it could be a useful part of a healthy weight loss diet. Bottom Line: Quinoa is high in fiber, protein and has a low glycemic index. These properties have all been linked to weight loss and improved health. The last one is not a health benefit, but still incredibly important.It is the fact that quinoa is very easy to incorporate into your diet. It is also tasty and goes well with many foods. Depending on the type of quinoa, it can be important to rinse it with water in order to get rid of saponins, which are found on the outer layer and can have a bitter flavor. However, some brands have already been rinsed, so this may not be necessary. You can buy quinoa in most health food stores and many supermarkets. It is also available on Amazon, with many reviews, testimonials and usage tips from real customers. Quinoa can be ready to eat in as little as 15-20 minutes: Put 2 cups of water in a pot, turn up the heat. Add 1 cup of raw quinoa, with a dash of salt Boil for 15-20 minutes. Eat. It should now have absorbed most of the water and gotten a fluffy look. If done right, it should have a mild, nutty flavour and a satisfying crunch. Then there are dozens of other delicious ways to use quinoa.